Custom Tablecloth QuoteGet your custome table cloth quote here! We have three collections. Our everyday collection provides excellent value for money. If you’re looking for something a bit more special, you should find it in our luxury collection. Our premium luxury collection supplies the crème de la crème in Irish Linen, so if you want the best, this is the choice for you. Everyday dining need never be the same again, choose from our Everyday collection of linen napkins, linen table cloths, linen placemats and linen runners to transform your dining room. This collection is made from 100% Irish Linen. Entertaining friends and family? Make the experience extra special and choose from our luxury collection. This range includes linen napkins, linen table cloths, linen placemats and linen runners in a wide range of designs to suit all tastes. This collection is made from 100% Irish Damask Linen. 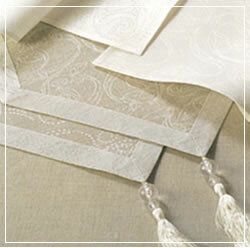 Linen Damask has a beautiful drape and lustre that will flatter any dining room. This hugely popular range is consistently our best seller. Our Premium Luxury Linen provides the ultimate in fine linen luxury, so if you really want to impress, this is the ideal choice. This collection is made from 100% Irish Double Damask Linen. 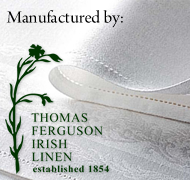 Its traditions and heritage stretches back centuries, and our supplier Thomas Ferguson & Co. Ltd remain the only weaver still producing it in their factory in Banbridge, County Down. Ferguson's double damask napery is supplied to the world's top retail establishments, exclusive households, palaces, embassies and finest hotels. It is the chosen table linen of many of the royal households and nobility of Europe, as well as many of our top celebrities.